Meet Gunter, your cuddly metal coworker at U.N.A.T.C.O. Set in the future, Deus Ex plunges you into a conspiracy that would make Fox and Scully blush. The newest member of the newly formed UN counter-terrorism agency UNATCO, you are first charged with recapturing the Statue of Liberty from a nationalist militia. From the moment you step off the dock, you are faced with a variety of choices on how to proceed. Do you burst into the scene with guns blazing, or lurk in the shadows to avoid the patrols? Do you hack the security computer, try to find the password, or bypass security completely? 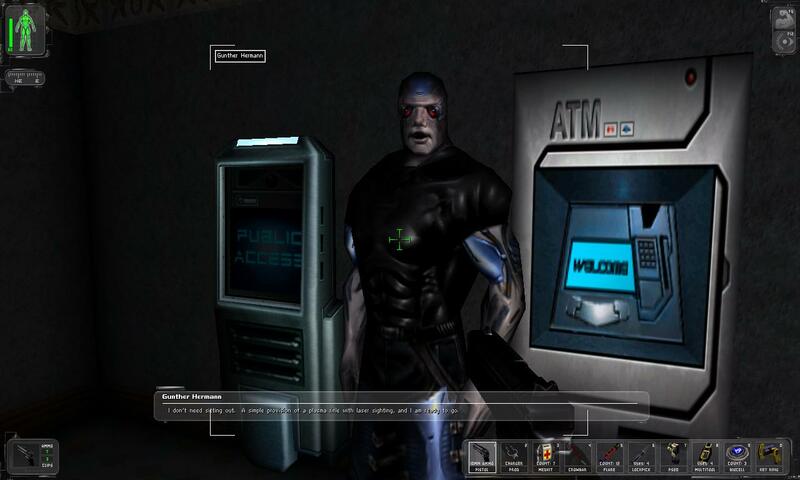 Unlike most other games, Deus Ex provides a surprising level of open-endedness in how you go about accomplishing your objectives. This not only gives you a greater feeling of control over your actions, but it also adds replay value. In the course of the game you brush up with almost every well known conspiracy theory, from secret societies to who really killed Kennedy. Much of this back story is optional, and gives you another reason to fully explore the game world. Although most of the bugs have been worked out by now, Deus Ex still has a couple of minor flaws. Some of the information the game gives you is incorrect. For example, in the last mission of the game you find out the coolant door code is 2242, but the code doesnt work in the door. While this is a relatively minor point, since you can bypass the door lock with the right tools, there are enough of these mistakes to make it rather frustrating. One of the main mission objectives never goes away, whether you complete it or not, and you can bypass large sections of the game if you have the right codes. However, these are relatively small complaints, and can be easily remedied. Deus Ex is a great bargain for anyone wanting a game that will slowly consume several hours of their lives. Because it's been a while since it was released, prices are in the $19.99 and below range. It's few flaws are hardly noticeable and easily overcome. In short, there is no reason why you should not own or buy this game.